I wanted to try engraving on the sides of a square glass candle holder (kind of like the bottom half of a square bottle), but it's too thick to fit in the laser. The bottom plate of the laser is removable, so I built a square frame out of some 8020 aluminum extrusion (#1030) to put under the laser. It's essentially an aluminum 1x3, with 3 t-slots on the 3" sides and one t-slot on the short side. Had to do some milling so the gusset plates on the laser corners would fit. The removed bottom plate of the laser slides into any one of the 3 available t-slots. Hope to try it out in the next few days but other things seem to get in the way lately. Sounds interesting Dave, some pictures of the mod would be nice. The 8020 frame is a 4-sided rectangle slightly larger than the size of the laser frame so that the original bottom cover of the laser will fit into the t-slots on each side of the frame. The 1" side of the extrusion rests on the bench, and the laser sets on top of it. The sides are tied together with t-nuts and aluminum angle at each corner. One end is removable so I can pull out the original bottom plate and slide it into a different slot depending on the height of the material being lasered. If I didn't need to machine the ends to clear the corner plates of the laser frame, it could have been bolted together in just a few minutes. It turns out that the original base plate for my laser is quite thin, and warps easily when not screwed in place with the original zillion screws. I happened to have some highway signs that were gathering dust in a dark corner of the shop.... Sacrificed one of them for a new base plate. Cutting it was a noisy job, but it's 1/8" aluminum, and way stiffer than the original base plate. 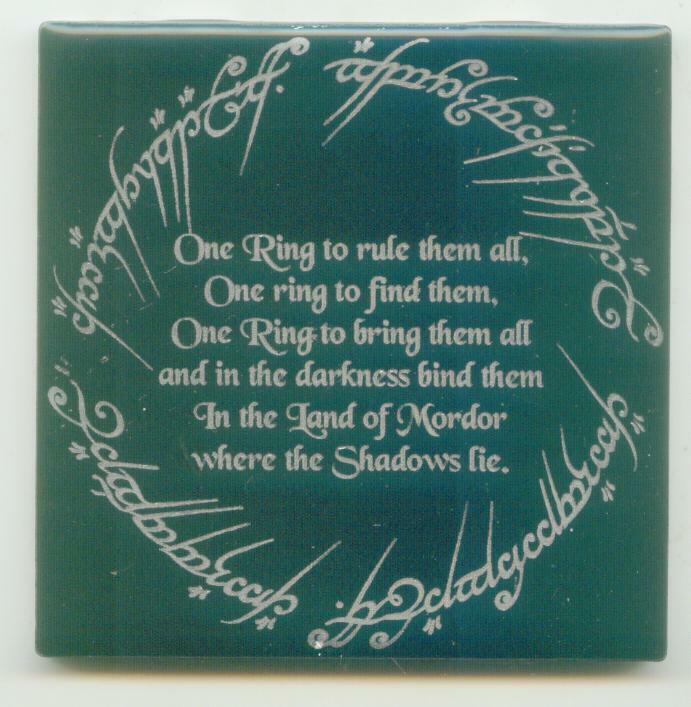 Did a tile to celebrate Applied silver rubNbuff to it - that stuff is really nice! Took 15 minutes at 75% speed and 75% power, 0.002" stepover for a B/W bitmap file. Following a request, on another forum, I have developed another little device. 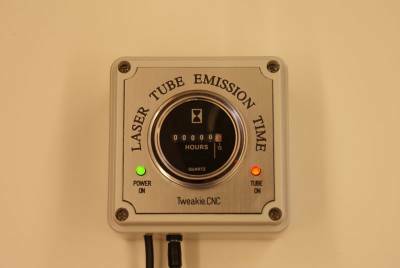 This unit records actual laser tube emission time, as opposed to machine run time, and is intended to provide an indication of tube lifetime. It uses RF technology to detect the laser tube emissions so requires no electrical connection to the host machine and will be suitable for use with all makes and models of commercial laser machines which use a dc excited glass laser tube. Laser tubes have a finite lifetime which can perhaps be likened to draining a tank-full of water – just how long it lasts depends on how wide the tap is opened, however, this unit should be useful in providing averages. The initial ‘rats-nest’ model has clocked up some 15 hours now and I am looking forward to some serious testing of this, the first prototype. Congratulations. Looks like a needed product. Your ingenuity and inventiveness continues to amaze. I paint with a blue light beam. tweakie, Congratulations, very clean design! Did You use some aerial to detect that the tube is on? Yes, a small antenna is used for the detection. I built a small test rig which gives off similar RF emissions to an operating laser tube so I could test run the unit without using the laser. After a couple of hours the clock stopped. Cutting the clock apart revealed a long plastic shaving caught up in the gear train and although the mechanism was beautifully constructed the Chinese manufacturers of this device seem to have absolutely no idea of quality control. Cleaning, removing the debris then gluing it all back together seemed to have resolved the issue and the 24 hour test then continued without fault. Prototype #1 is now off on it’s travels for further testing with professionally manufactured laser machines whilst prototype #2 is now running 24 / 7 until destruction. I am usually on Johns page PEP4 but his laser experience is limited and He mentioned I should ask you with my CO2 questions. My DIY laser is a 40 watt power supply (china) and a 45 watt laser tube (Rabbit Laser). We, you and many others have it running pretty good ( I thank You ). I am questioning about my fear to turn it up. I see where the ones that are using 2 watt diode lasers are running speeds as fast and faster ( IPM )than my 40 watt. I am able to work with it and an pleased with some of the stuff I have been able to do. I have tried to etch a piece of mirror but my fear of the unknown would not let me turn it up much past 15 MA. and It wouldn't even leave a mark. I have some Slate I would like to try something on as well as some Talk (Soap Stone?). Will they be OK to use with the laser? I did mention to John that some of the things they have been doing with that PEP4, 45 deg. diode laser is real great. I was thinking about adding a diode laser to my machine and being able to do both. Good or bad idea? I have plenty of room but the wiring might get a little tight. I've used my 45 watt with good results on black granite tile, smaller black marble stones from the local home improvement store. Both burn lighter shades, marble looks better, less grainy than granite. Black or white ceramic tile burn easily too, but you have to fill with a contrasting color (like rub'n'buff). I tried glass tile from the same sources, they have a colored ceramic coating on the back side that is really hard to burn thru at higher speeds. The image actually looks better on the back side than from the glass side. On glass, I use 100% speed and around 40% power. On mirror backs I need to use more power. 100% power on mine is about 18ma according to their digital display. Rastering an image on my FSL laser is very quick, around 1100 IPM. Vector engraving is quite a bit slower feed rate, no idea what the actual IPM is for that. Had a windows crash last week, still rebuilding from that wonderful [ expletive deleted ] episode. Hope to be back on the air over the weekend. Glad to see you've not abandoned us. Sorry to hear of the problems though. Wow, 1100 ipm is fast. Hope you're back up and running soon. I'm now thinking that your engraving speed issue may be more related to having to use TTL rather than a lack of power. With TTL, Mach3 will run slow since it has to move to each position and 'pause' while the laser is triggered. This is also true for laser diodes operating in TTL mode. Unless a 3 ma difference represents a lot of power reduction for a CO2 laser, you are operating at 83% of the power Dave uses. You should be able to burn through a lot of wood thickness at that power. Does it? You could perhaps check the accuracy of your milliamp meter but I would not recommend exceeding 18mA for a 40 / 45 Watt tube. If you do it could shorten the tube’s life expectancy considerably. My view is that with all work the important thing is the quality of the finished product and speed is only a secondary consideration. I think it would be a great idea for you to add a diode laser to your existing laser machine. It could just be a ‘bolt-on’ addition – Mach3 handles offsets easily so it does not have to be centrally positioned (I have a small ‘add-on’ diode laser which works very well, albeit rather slow compared to the CO2). I have started my duel laser system. CO2 and Diode and have been studying the two main ways to power the diode laser (mechanical and electrical). Jeff is using the mechanical and mentioned to talk to you about the electrical method. John has a right up explaining both ways and I was just wondering which way you might prefer? I am at ease doing either way but I do value your expertise. I am pleased to hear that you have decided to add a diode laser and I am sure that you will find it most useful with photographic image engraving. It is basically just another tool, and we can never have too many tools. My preference would be for the digital potentiometer option (as Dave pioneered) but as Jeff has tried both methods and still favours the mechanical solution you should perhaps be prepared to try both options as well. 4.25" black ceramic tiles vector engraved and back filled with gold rub n buff.